To provide feedback on the Community Policing Dispatch, e-mail the editorial board at CPDispatch@usdoj.gov. In early December, I had the privilege of joining local law enforcement officials, federal prosecutors, and other U.S. Department of Justice partners from across the country at the Project Safe Neighborhoods (PSN) National Conference in Kansas City, Missouri. 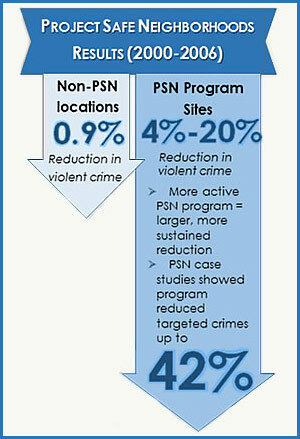 PSN is a federally funded program that provides funding and resources to establish crime reduction task forces and develop individualized strategies that meet the needs of the local jurisdiction. Interagency collaboration is key—law enforcement, prosecutors, and probation and parole offices spanning the local, state, and federal environments all must work together to make communities safe again. Local community organizations also play an integral role in communicating and garnering support for these strategies amongst community members. Throughout the conference, I heard from law enforcement officials about the importance of this initiative and the impact it’s making on their communities. I chaired a panel on community policing and discussed the important and influential work being done in the Prince George’s County (Maryland), Dallas (Texas), and Asheville (North Carolina) Police Departments to build stronger connections with their communities to address violent crime. In some cases, these connections were previously strained, but through hard work and dedication, these chiefs are helping to change the narrative by changing the reality. If there is one thematic takeaway that summarizes the PSN National Conference, it is this: Local law enforcement and the communities they serve are in the best position to identify their needs and develop solutions to their problems. And when we support that philosophy at the federal level, we can help make a major impact on crime and improve the lives of citizens across this nation. In the same vein, we reengineered the COPS Office Collaborative Reform Initiative for Technical Assistance (CRI-TA) last year to take on a “by the field, for the field” approach. And the field is responding. To date, we have fielded nearly 100 requests from law enforcement agencies seeking assistance on topics such as crime analysis, performance management, mass demonstrations, active shooter response, Comstat for citizens, and de-escalation training. We’ve also pledged to provide CRI-TA services to PSN sites and consulted with them during the national meeting in December. The criminal justice community works best when we work together and listen to one another, and PSN is a living, breathing example of that. At the COPS Office, we continue to strive to play our part and support the men and women in blue with resources, training, and technical assistance on their most pressing issues. 1.Edmund McGarrell et al., “Project Safe Neighborhoods and Violent Crime Trends in US Cities: Assessing Violent Crime Impact,” Journal of Quantitative Criminology 26 (2010), 165–90. To sign up for monthly updates or to access your subscriber preferences, please enter your email address in the Subscribe box. The Community Policing Dispatch is the e-newsletter of the COPS Office. Want to stay connected with the COPS office?